Today was one of the most glorious fall days in Vancouver. Unseasonally warm and bright, the fall colours seemed infused with a richness that made them seem to glow from the inside out. That is when I noticed my apple tree. We originally had three dwarf apples but disease and failure to thrive whittled the grove down to one lone survivor. The lone tree remained skinny and sickly and when it tried to produce apples the weight of them would snap the thin branches. My father-in-law had the solution “Prune it.” he said, ” Prune it back very hard.” I kind of panicked. The tree looked lovely with its long narrow branches in the spring with it’s tiny green leaves but he was right- every time the apples started the branches couldn’t support the fruit of the tree. So out came the shears. It was so sad. You prune the tree in winter when it is dormant and it look positively ugly when my father-in-law finished the task. Over half the branches were now gone and the ones that remained were half the size. I was sure the tree would die like the others. But that tree produced it’s little green leaves that spring. Hope for the fall sprung from the flowers that began to appear between the leaves. The tree had survived and seemed to be thriving. Sure enough that fall we had the best apples that tree had produced in it’s lifetime. Larger and more vibrant in colour than it’s seasons predecessors- the apples weighed down the branches but not one branch snapped in their fall burden. 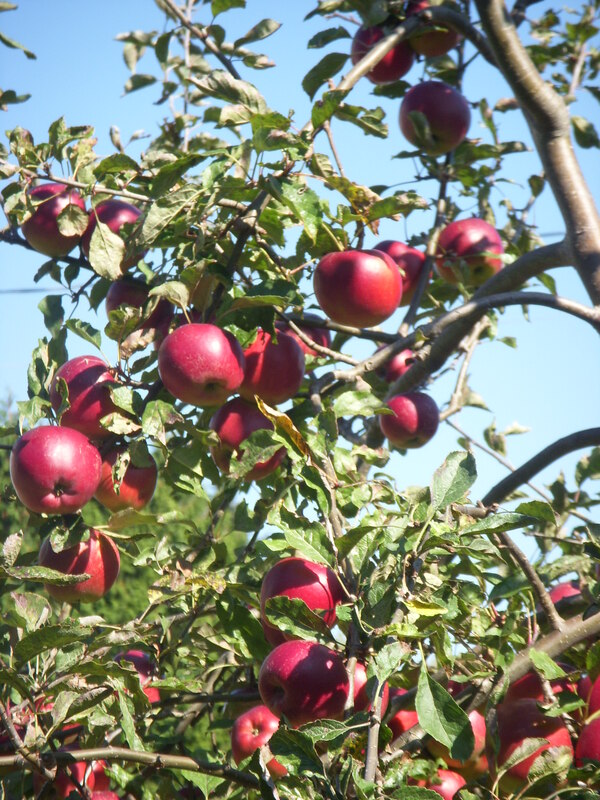 This year the apples are even more plentiful and their colour more glorious. I realized that my dwarf apple was a metaphor for muscular and organic energy. In yoga, when we apply muscular energy we pull from the periphery to the core – we actually shorten ourselves in a way- we make the branches shorter- and therefore stronger. Pruning the tree was a way to give the tree muscular energy- a way for it to pool it’s strength and create stronger limbs. In response the tree was free to produce organic energy in balance- big shiny apples on strong branches that could hold their weight. We often love that freedom of being long and loose- we interpret that as being bendy and stretchy. This is however, why often more naturally flexible people tend to get injured in yoga more than stiffer muscular types. ( see-being stiffer can serve you! Isn’t that great?) Joints can be more easily stressed and it is hard to stay strong for these longer lanky “trees”. However drawing the muscles to the bones, the muscles to the midline of the body and from the periphery to the core , makes these more flexible students stable. Hugging or drawing in like this is also a way to, on a more spiritual level, to know ourselves. My tree was better able to feed itself when pruned and produced better fruit. When we come into ourselves, we know ourselves better. We nurture and protect ourselves. When we are strong and integrated like this, we can then offer out more of ourselves- we can give those whose lives we touch better, sweeter fruit. I think when those apples are ready I am going to make one heck of an apple pie for my family.